In my previous post, I mentioned that this project is one that’s doing a lot better than anticipated… well, after that post, I obviously had pretty high expectations… and this month’s results managed to exceed those expectations. I honestly have never had a project take off the way this is going. The strategy, while expensive-ish, is paying off big-time. In the past 28 days, it was mostly about links, links, and more links. Focusing on quality juice to get the needle moving (and boy did it move). With a solid link building strategy in place, March will be about doing some decent CRO, and expanding the site into different keyword categories. I was a bit hesitant to report earnings this early on in the project, but decided to add them anyway as it shows that doing this stuff comes with a healthy amount of risk and upfront costs. So for now, earnings are definitely negligible, we’re focusing on getting the traffic at the moment, then when we see the site taking off (which we know now, check them rankings below), we move on to CRO to get the conversions. 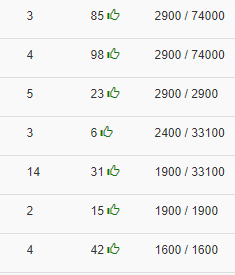 Tracking 107 keywords, we saw some insane gains this month, very happy with the results! The snapshots below show how the rankings evolved in the past 30 days. So of the 107 keywords that we’re tracking, in the past month, 8 went straight to the top 3, 38 (!!?) to the top 10, and 47 to the top 30… this is absolutely bonkers! Here’s a snapshot of a few decent search volume kws we’re on the first page for (first column is rank, last column is search volume national/global). Majority of the keywords we’re tracking have commercial intent. Next month will be interesting!